Rivers, hills and volcanoes, jungles, lakes and waterfalls. Mexico has it all when it comes to coffee growing…the taste will prove it to you! By far our best selling Organic coffee. By far our best selling Organic coffee for a reason. 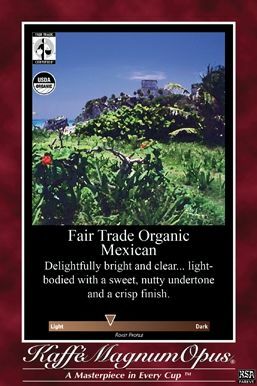 This organically grown bean has a great flavor and rich aroma. Numerous friends and customers have stated this to be the best coffee they have tasted and refuse to drink anything other. It really just stand the test of brewing a great taste cup after cup. Grab a 5 pound bag of this whole bean coffee and you will be back for more! This product is packaged and roasted by Kaffe Magnum Opus. PoundofCoffee.com is an authorized reseller of KMO coffees. This comes in 5 lb quantity only and will arrive in the original Kaffe Magnum Opus packaging.